The Margaret Flockton Award Exhibition returns to the Royal Botanic Garden Sydney from 9 April to 1 May 2016, showcasing some of the world’s finest contemporary scientific botanical illustration. Now in its 13th year, the award commemorates the extraordinary talent of Margaret Flockton – the Garden’s first botanical illustrator – and her enormous contribution to the field of Australian scientific botanical illustration during her career at the Gardens from 1901 to 1927. Unique among international art awards, the sole focus of The Margaret Flockton Award is scientific botanical illustration, an art that translates complex science into precise drawings rarely seen outside the highly specialised field of taxonomic botany. Competing for the coveted accolade and $7,000 in prize money, in 2016 the Award judges received 29 submissions from across the world (including Australia, USA, UK, Spain, Thailand, Brazil, Germany, Poland, Belgium, South Korea, Sri Lanka and Turkey). 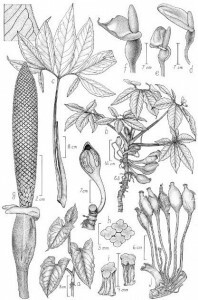 The submissions included works from artists based at Royal Botanic Garden of Madrid, Royal Botanic Garden Kew, the California Academy of Sciences, Uva Wellassa University, Sri Lanka, Korea National Arboretum and The Smithsonian Institute, Washington D.C.
“Illustrations accompany published taxonomic descriptions of plant species, highlighting distinctive features, and must be done only in black ink or pencil,” said Catherine Wardrop, Botanical Illustrator at Royal Botanic Garden Sydney and co-curator of the Margaret Flockton Award. Judging this year’s award are exhibition co-curator and Botanical Illustrator Lesley Elkan, and Botanist Dr Trevor Wilson, both from Royal Botanic Garden Sydney, and Anne Ryan, Curator of Australian Art at the Art Gallery of NSW. The 2016 Margaret Flockton Award Exhibition is part of the Royal Botanic Garden Sydney’s 200th Birthday program and celebrates the Garden’s heritage and ongoing commitment to excellence in scientific botanical illustration. Many of the contemporary illustrations will be for sale and a selection of original Margaret Flockton works will be on display including exquisite pencil renderings, lithographs and watercolour paintings that demonstrate her meticulous observation, flawless accuracy and supremely elegant style. The annual Margaret Flockton Award Exhibition is sponsored by the Maple-Brown Family and the Foundation & Friends of the Botanic Gardens.